I am a bit of a “foodie”, albeit a vegetarian foodie. I’m also a health food nut. I don’t like all the salt and sugar and oils found in most processed food or restaurant take-out stuff (although once in a while, I do partake of a not-so-healthy meal while dining out, as a treat; the bad stuff definitely makes food very tasty!). In order to have a regular supply of healthy and enjoyable veggie food (not quite as delicious as the high-fat/sugar/salt stuff, but still pretty good), I do most of my own cooking. But that’s OK because I find cooking to be an opportunity for experimentation and creativity. So in addition to being a “foodie”, I’m also a “cook”. Any cook who has done anything more than boil water knows that onions are essential to cooking. Onions show up in the cuisine of humans from around the planet. You can cook without onions, but it takes more work to come up with something tasty. Sure, some people just don’t like onions, and other people have medical conditions that require abstinence. Nonetheless, onions, along with garlic, are described as the “bedrock” and the “foundation” of cooking. To be honest, I grew up in a mostly onion-less household. My father would get stomach problems from them, and so I was mostly unfamiliar with what onions do for soups, sauces, stews, salads, etc. When I did come across onions while in my childhood, I would avoid them, as they tasted too exotic. If I got a hamburger at a drive-in that had onions, I would open the bun and remove them, even if they were tiny chopped bits (as with White Castle mini-burgers). Only in my late teen years did I start to appreciate the flavor of onions. Ironically, my initial onion-experiences were via fast food; I finally got tired of picking the onions off of my McDonalds burgers (this was 15 years before I would give up eating meat). Before long, I learned to enjoy the extra flavor kick that onions imparted to my junk food. After I graduated from college in 1975, professional entry-level jobs were scarce. I finally landed something in the Washington DC area; thus I had to leave home in Jersey and live on my own. My mother taught me some cooking basics so that I wouldn’t have to depend entirely on eating out of cans or take-out boxes. I thus learned how to cook, mostly on my own, by trial and error (and with my mother’s written instructions; I still have the little cooking notebook that she wrote out for me). I also learned how to navigate the local supermarket. After a while, I finally crossed the onion line — I went to the produce section and bought some of those brown round things with the thin flaky skin. I brought them home and learned how to peal and slice them (and how to avoid the tear-inducing spray that they sometimes created). I figured out how they could be put into spaghetti sauce and into a basic beef stew, and over time, I found more and more uses for them. It took a while longer for me to go really out on a limb and buy a bulb of garlic. But by the 1980s, garlic also became a regular on my refrigerator produce shelf. Today, in my old age, onions are an old friend, along with garlic. I enjoy using a variety of onions in my dishes — the plain old brown onion, Spanish onions, white onions, and red onions. And not too many years ago, I started getting to know the uptown cousins of the humble onion — i.e., scallions, shallots and leeks. So let me say a few things about these three “onion alternatives”. First off, they are more expensive than regular onions. But sometimes they are worth it. For most of my basic cooking, I still use regular onions. When you are going to boil something or heavily sauté it (including stir-frying), regular onions do just fine. The problem with regular onions is that they have a lot of “off-flavors” in them, a bit like sulfur (which onions have in them). Even if you really like onion flavor, you don’t want to bite into most onions as you would a carrot or tomato; you are going to experience a lot of other strange tastes, some bitter, some sour, most not too pleasant. When you heat up onions as in a boiling soup stock or in a sauce, these sulfury “off tastes” eventually evaporate, while much of the basic savory onion flavor stays behind. (This is why many people prefer sautéed onions on their burgers versus raw onion slices). Scallions, leeks and especially shallots are different in that they have very little “off flavor” to them. So they make good last-minute additions to a stew or soup or sauce, especially when you are heating up something that you’ve already made and were keeping in your refrigerator. Scallions and leeks are also known as “green onions” (not to be confused with “spring onions“, which are like scallions, but generally aren’t available in the places where I shop) as they are green and leafy, at least part of them. As such, they can add a bit of fiber and texture to a dish on a last-minute basis. However, you don’t want to use them when you originally cook a sauce or stew or soup; their leafy nature will get boiled down and they will become ploppy and indistinguishable. You mostly want to save these “special onions” for use as a garnish (although they do need some level of heating, you don’t want to eat them raw). I generally try to cut them into small pieces, such that they don’t become too “chewy”. So both leeks and scallions are “green onions”; what is the difference? Leeks are obviously bigger and more fiberous than scallions, a bit “tougher”. 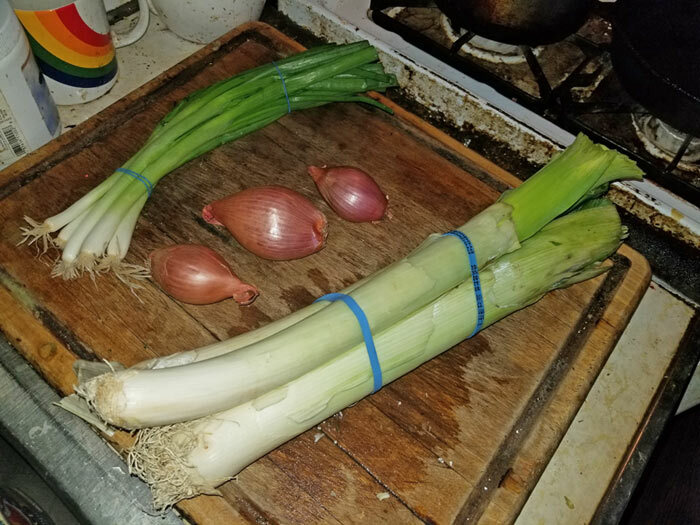 To be honest, I find that leeks have a stronger onion flavor than scallions (and again, their native flavor is much more “pure” than most regular bulb onions). Given that leeks are tougher than scallions, scallions are better where you are making something delicate, something that you aren’t going to heat up or cook for too long; they do OK as a top-garnish upon serving (so long as they have been properly chopped), and would be a good addition to a salad. Leeks do better when they are placed “deeper” in the food and are exposed to some heat, as when a pre-prepared dish like stew is being warmed up. There are also some dishes where leeks are used in the original “boil-down” (or “reduction“, in true chef language). The best known example is potato and leek soup. Cut-up potatoes will break down and thicken up fairly quickly when boiled in water, such that leeks can ride along and retain some of their green, leafy character. This plays off well against the gloopy potato stock. Their delicate flavor also plays well against the starchy blandness of the potato. You could substitute regular onions and get most of the flavor, but you would miss that bit of color and texture that leeks impart to an otherwise boring potato soup. Next, let’s talk about shallots. Shallots look a lot more like regular onions. When you first see them, they just seem like small onions with a tear-drop shape. If you compare the price per pound of shallots versus regular onions, even against the better onions like red or white, you wonder what could possibly justify your paying twice as much (or even more). Well, here’s the deal. I was finally induced to try a bag of shallots when I saw then on-sale at a greengrocer (yes, there are still a few surviving produce-only stores, mostly in urban areas; my “shallot store” is in Paterson, NJ). Then I realized — shallots are the pure essence of what onions are all about. Shallots are everything that you wished that onions would be. They generally should not be used in a “reduction”; just chop and saute them a little in some olive oil (or butter, if you aren’t a vegetarian health freak), maybe with some mushrooms, and eat ’em straight. Shallots are true royalty. They are a side-dish in themselves. You don’t know what you are missing until you have them. So, you don’t use shallots like you would use a regular onion; that would be a waste of money, as their special flavor would get “lost in the sauce”. But if you want a really wonderful side-dish or a relish to enhance your main dish, lightly sauteed shallots will do the job, and do it well! I recently was inspired to make up a new dish of my own using all three of the allium aristocracy. I very much enjoy eating pasta with a tomato-based sauce, but occasionally I seek a pasta sauce alternative (one that is not based on cheese, as I have given that up — so no alfredo or basil pesto, although a soy-version of pesto is possible). I decided to make up an ad-hoc sauce by chopping scallions, leeks and shallots and sauteing them in olive oil with some diced pepper and a bit of sliced garlic. I added a touch of powdered veggie soup bouillon mix for a bit of salty flavoring. Then I made up a plate of wide fettuccine and added the allium sauce to it, and I found it to be sublime. The main flavor theme of the sauce was onion, of course, but again — it was “onion as you’ve always hoped it could be” — mild and sweet yet tangy and pungent, without impurity and sulfur. The leeks and scallions gave the sauce just a bit of color and texture (along with the peppers), but they worked in harmony with the smooth flavor of shallots. And that’s my thoughts on the “onion alternatives”. Oh PS, a real food expert might ask me, why didn’t I mention chives here. Well, I haven’t had much experience with chives, but from what I do know, they are basically smaller, more grass-like versions of scallions. They have a slightly different pungency to them, just a bit more garlicky. They represent another interesting onion option, one that I might yet experiment with. But for the most part, chives “are typically used more as an herb or garnish than a whole ingredient”. So what do I think about chives? Well, they clearly should not be used the same way that regular onions are; they are mostly a garnish. I chopped up a few of the chive sticks and put them over my usual Saturday night meal, eggplant with sesame and peanut sauce. They in fact did add a bit of interesting flavor to the dish, with their slightly garlicky taste. But they aren’t very assertive; you need to think about them in order to notice their flavor. For $3, you’d do better with a small bag of shallots. However, chives are relatively easy to grow at home indoors, although you do need a sunny window. Jim, A nice explanation of the onion family. I was never too sure of what was what when it came to leeks and shallots. I must confess, however, that when it comes to eating onions as such, I simply do not want to SEE an onion. I like them for flavor in a recipe of some kind, but eating them cooked or not cooked is not for me. I had a bad experience with onions many years ago which left me not ever want to SEE an onion in anything I ate; if I taste it and do not know it’s onion, it’s OK. Odd how the human being works. 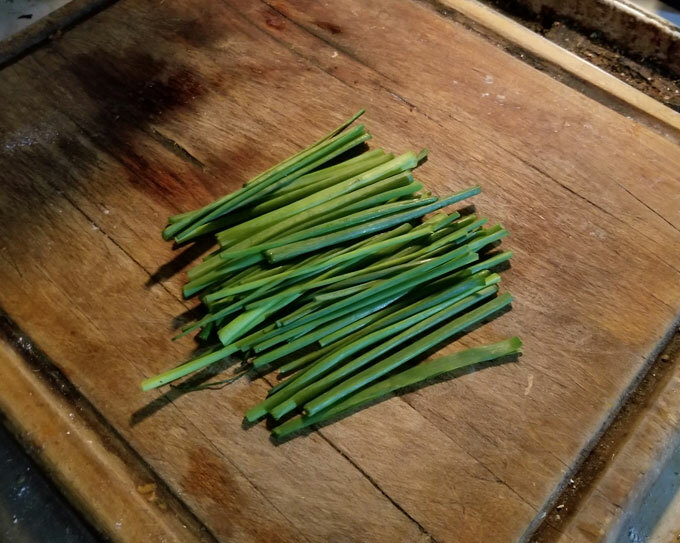 In the days when I was cooking, I often used chives for color, decoration, and onion taste. I do have to say that I never really understood what scallions were, but I do now; so chalk one up to information given and received. As you yourself admit, I too have often tho’t that the times I’ve eaten vegetarian or even vegan cooking I’ve found it lacking in taste (not sure if onions were present or not); I blamed it on perhaps the taste of beans (another food I can do without), but now that you mention it, more likely it was the absence of onion taste. I must say that in my distaste for onions I have neglected to ever find out what the difference is among the various types of onions—red onions, for instance, vs yellow or white onions’ but I do recognize the sweet onions from the “non-sweet” onions. Red onions usually appear in salads of some kind and are pushed aside by me. I beg to differ with you when you describe yourself as in “old age”; I would categorize you as “approaching old age” or “getting near old age”; you definitely are NOT in your “old age” yet. I’ve been where you are and am now past where you are in age; I am sure that there’s a difference between “approaching old age” which may take you 10 to 15 years yet and actually being in “old age”. I might add: Enjoy the “approaching” age you are in while you can.